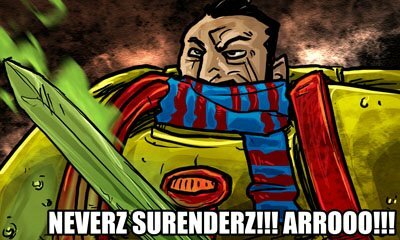 Goatboy’s 40k Thought: NEVER SURRENDER!!! Today’s thought is about not giving up. The biggest bit of advice, that in a lot of ways can pull you out of a bad situation in a game, is to never give up. I know we have all had those games, where everything you do to an opponent is ignored. When you are playing a game that is based on a dice roll, there are just times when everything a person throws just lands right. Now we all know, just thinking positively can’t win you the game, but at least can give you the best chance to come out on top. Where am I going with this? Well I wanted to write a bit about the tournament I played this past weekend. It was a hobby tournament, and for those wondering, Hobby means not your grossest list you can come up with. There is a comp scoring system, and if you are a crappy player with an unfun army, you will most likely lose enough points to equal a full game lose. This type of tournament, besides pushing the “creation” of different armies, really brings out some of the better games in people. You mix that with the local store’s tournaments always being free, means you are looking forward to three games, not the stuff you are trying to pay for with a small price. The list I played with my Fabius Bile list I’ve written about. Here is the basic build out for those interested. The list gives me a lot of movement with rhinos, plus I have the options of creating rhino walls and other obstacles to have people go through. 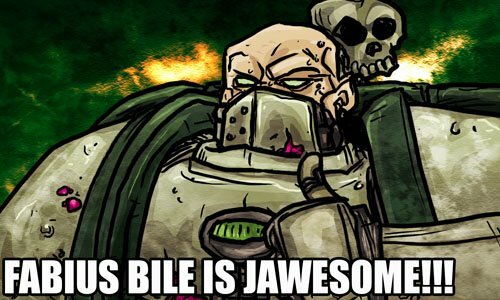 Also, it has Fabius Bile, which is a lot of fun when you are rolling to see what happens to your boys in your army. The interesting thing about this tournament, was that we didn’t have any ork players. We also didn’t see any necrons. There were some Black Templars, lots of chaos, some Tau and some marines mixed in together. I don’t have the exact list, beyond the fact that there were no Orks. Now onto the games. I didn’t take any pics this time, since I didn’t grab my better camera. But I will go through some of the basic turns and how the game went and how I lost one when I could have at least pulled out a tie if I played better as well as not gave up. Daniel is a local college kid that started coming to the store last year. He has really gotten a lot better since he first started, and decided to bring Tau, as his orks are a bit heavy (it seems most ork builds go towards the heavy side of things). He was playing Tau and had two Rail gun suits, some dudes and some Crisis suits. Nothing too crazy. He went first and too the side that had a wall he could do the lovely jump over fun from the Tau. I rolled a 4 for the Bile upgrade, and then I proceeded to roll a 6 to steal the imitative. What is crazy is that this is the first time I have every stolen it, and I really hurt Daniel in my turn. I moved up with my rhinos, jumped out and proceeded to shoot up some kroot hiding in the forest. They failed some saves, failed a leadership and they proceeded to almost run off the board. They failed to rally and then were chased off when my DP go into the fire warriors in the front. Beyond all of that, Daniel failed a lot of wounds and I made a lot of saves. From there I just moved forward and shot things till they were dead. I got into assault and that was it. I got max points and Daniel got the secondary and tertiary. Personally, I really hate Black Templars. All their armies are pretty much the same, and the only competitive ones are build this way. Lots of dudes with preferred enemy, two LR’s with tough termies ready to hit. This is the game where I gave up, when I shot a LR with 6 meltas, all within double range, hit with 5, pentrated with five and then watched as he rolled 5 cover saves due to the smoke and him going first. I set up right, moved right, but with the whole hot rolling by Jay, I just gave up. Besides that my DP did 4 wounds to termies, and the made 3 5 up saves. From there I just gave up and played really badly. How you ask? Well, since you are dealing with an assault style army, I could have led guys around, using the rhinos to create hitting on 6 walls. Yeah he could have rammed with his two LR’s, but that would have still been hard to get through. Once I set that up, I could have run and tried to tie by holding objectives, or just created a much harder game for him to win. My obliterators were placed wrong and I could have used them to kill off the Dreadnought as well as the other LR, thus making his termies hoof it through rhinos and difficult terrain. I got no points for this game, beyond the normal 5 for painting and 5 for theme. I gave Jay a 3, as I find the army to have too much teeth in a hobby tournament. But then again, I think anything that gives you rerolls to hurt the game of 40k (FNP, preferred enemy, bosspole). I’ve never played Michael before, and have seen him during Thursday night games at BFG for the last few months. Michael has a nice brown Nid army, that is all magnetized. It is hilarious to see his metal tool case unfold, and all the nids sticking to the top as well as sides. It makes it look very cockroach like. Michael was a blast to play, and I feel for him as all the bad luck of the previous game was now put towards Michael. Plague marines are a pain in the but for Nids and this game proved it, with an assault with guants having 51 attacks, and only causing 1 wound to my normal Marines. I also had 10 Genestealers assault my DP, only caused 1 rend, and my DP saving it. I had killed 4, there were not near a Synapse creature and they ran off the board. I chased them down with a rhino. I killed most of the other big nids in assault after an initial round of plasma/melta fire. By the end of the game, Michael had a lictor in some terrain and some guants that were about to be assaulted by a DP, some plague marines and another squad of dudes. This was one of those games where you feel bad, as everything seemed to just fall into place for you, and your opponent just couldn’t catch a break. Michael was a good sport, and I would like to get a rematch. After all was said and done, I took 3rd place by 1 point. Overall winner was Nick Rose with Daemons, Jay with Black Templar, and me with Chaos. I thought the army was a lot of fun to play, and really gave me a lot of options to move around the board. With the push of LR’s and melta in general, rhinos get left alone a lot more, thus giving you lots of chances to create walls as well as options to just bait an opponent with flimsy boxes of metal. I hope this helps in seeing how, no matter what, don’t give up. Trust that your army can do something. Yeah you have those games versus an army that just out classes you, but 5th edition 40k has turned away from the super kill fest and has moved onto a game based on objectives as well as opponent control. If you play smart, you can pull out a victory when it looks like you are at the brink of defeat. And if you are going to lose anyway, you might as well find some small bit of success with either killing something cool, or breaking the walls of math hammer (ie killing stuff you normally shouldn’t, or breaking a unit that shouldn’t lose combat). Next week, I plan on using Bigred’s camera to get a painting with washes article up, using quick methods to create a neat, multi hewed look that is a bit dry brush, bit heavy brush, and lots of color choices to get something quickly done. If there is anything you want me to talk about paint wise, add a comment and I will try to do my best to add it in. If you have any questions email me.